Tucked away within the storm of development, district growth and record breaking visitor arrivals is a surprisingly secluded beach front site set up to accommodate yourself and up to 4 others in a glamping style arrangement. Sheltered from cold southerly winds and with expansive views to the north this is an idyllic spot to soak up the sun and enjoy the bucolic surroundings. While you will still see and hear the helicopters and sightseeing flights coming and going, the only other people you are likely to encounter are fishermen trying to catch a rainbow trout or the farmer moving sheep to fresh pastures around the lake from time to time. The most activity you will see is likely to be on the lake as the swans, coots, crested grebes, paradise ducks and other water fowl cruise the lake at their leisure. Ironically, although you will be surrounded by the serenity of nature, you are also only about 5 minutes away (depending on traffic congestion) from Queenstown international airport. 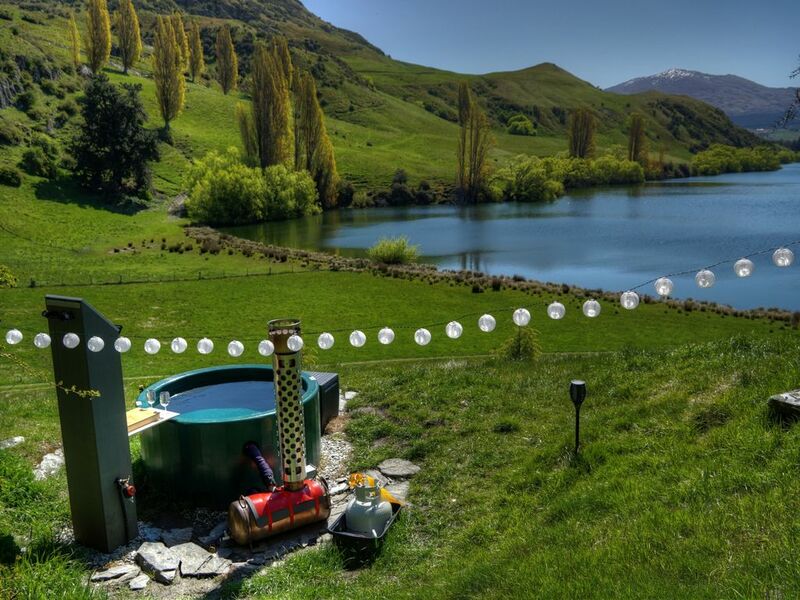 You will be able to use a fresh water hot tub that is located just 60m away from the tent. It is equipped with direct and indirect lighting and has a music player loaded with relaxing spa music. Bottled water is provided here too. A BBQ is supplied for cooking along with a gas powered refrigerator great for keeping cold beverages. Hot drinks can also be prepared using an electric kettle powered by a remotely operable generator. A toaster and hair dryer can also be used with the power from the generator. Filtered drinking water is also available on tap. Hot water is gas heated and available for showering in a generously sized solid vinyl floored tent specifically for that purpose. An electric flush toilet is located in an adjacent tent also with solid vinyl floor. A wine barrel has been repurposed for use outside as a vanity unit. No smoking (fire danger is high especially in summer). All gates must be relocked when coming in or going out. Due to natural hazards near the site (cliffs and lake for example) this location may not necessarily be suitable for young children. Parental supervision of young children will be essential. Visitors are only allowed by courtesy of, and at the discretion of, management at all times. Guests must depart by 10pm. A fresh water hot tub is available on request. One gas bottle change is also included in the rate for this facility.